Huckleberry Hound and a gaggle of Hanna-Barbera's biggest names drive out to Jellystone Park to visit Yogi and Boo-Boo for Christmas but, wouldn't you know it, Yogi and Boo-Boo have stowed away on a bus headed for the Big City so that they can visit all of their friends. 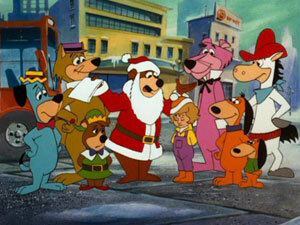 On the run from Ranger Smith, the police and some guys with nets, Yogi and Boo-Boo pose as a department store Santa and an elf. Soon enough, they meet Judy Jones. Little Judy is sad because all see wants for Christmas is a Father who'll spend some time with her (Daddy didn't give attention). Yogi, not realizing some people get a little uptight when you take an unaccompanied minor out of a department store, takes Judy to the park for a picnic. What follows is a city-wide manhunt for Yogi and Boo-Boo, who are believed to be kidnappers. Also, for some reason there's a cameo from Fred Flintstone and Barney Rubble where they beat up Snagglepuss in a sort-of charity scam.